GIFTS LIFE GIVES TO US | NATÉRCIA TIBA - psicóloga, psicot. de casal e família e autora do livro "Mulher sem Script"
I have always liked metaphors. Actually, I think that sometimes it is very difficult to express some ideas and, at these moments, metaphors can be very descriptive. I am also a very observing person. I grew up with my father showing me nature’s details and peculiarities in people’s behavior (he still does with his grandchildren, who amaze themselves at the ants marching up and down, with the fruits hanging down the trees…). I did not choose psychology by chance. As my father says – “ life is very generous” – and I agree with him, although I think that life is generous to those who are open to embrace it, willing to see it, feeling it with all senses and devoting themselves to life itself and to others. In the day by day life with my children I try to keep this attitude but, with kids, this is not a very easy task since they are curious and intense by nature. In January of 2010 we decided to spend our vacation on the beach, after having dated this possibility for a long time. It is amazing how new things can fascinate us while the routine ends up becoming too familiar and not so enthusiastic. It’s too bad it happens that way. During our first week on the beach everything was new and, thus, filled with enchantment. The soft and hot sand, the waves touching our legs, the sound of the ocean, the colorful shells: everything was a reason for: “Mommy, look at this. “, Daddy, come and see how cool this is”. It’s all very pleasing but also very tiresome because if we don’t pay attention, the children will think that what they are looking at is not that cool and then, little by little, the enchantment fades away (who are we to take away the sparkle of their eyes? It is us, grown-ups, who actually need to recover it). One morning we decided to go “shell hunting” to start a new collection: The shells of our 2010 vacation. This is one of the human needs: to name things as if, through naming, we can possess them. 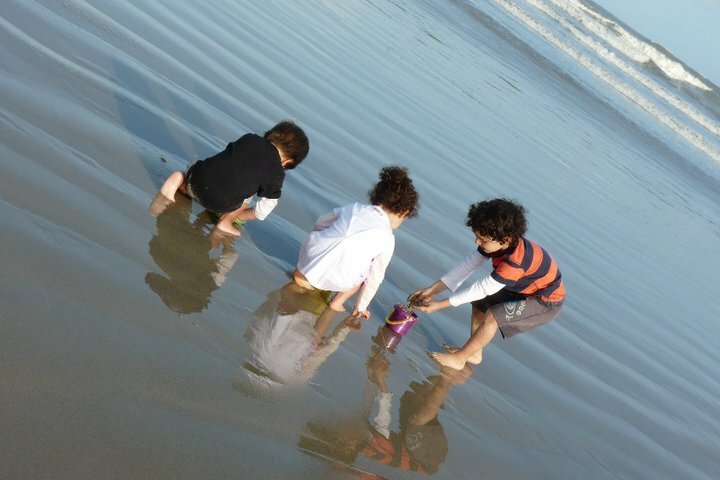 While my husband read under the sunshade, Dudu (8 years old) and Ricardo (4 years old) grabbed their bucket and off we went to that stream of sand where the ocean leaves its presents (and, on polluted beaches, the trash thrown by men, which is very upsetting). I call it the stream of presents because, when the oceans withdraws after a wave, it leaves shells, small crustaceans and, to me, one of the biggest presents of all, the drawings on the sand. My boys and I kept walking, each one collecting their own shells while I would take turns helping them both. And then Ricardo found an enormous shell: purple, beautiful, different from all the others that were smaller, white and beige. We were mesmerized and placed it together with the others inside the bucket. Dudu, after his reaction of surprise with such a marvelous shell, immediately went into a crisis. He started crying; he wanted one of those! None of his shells were as beautiful as that one. At that moment, his brother’s collection became far more interesting than his own. How awful! It’s amazing how our first impulse is to repeat what we hear as a child, even though we swear we would never do this to our own children! I took a deep breath and focused on my mantra Quem ama, educa (“Those who love, educate.”). No, I am not doing any advertisement. But, how many times my attitudes were the reason for laughter or comments such as: “Oh, the daughter of the Quem ama, educa acting like this”. Ha, ha, ha. Sometimes they were stones others just small pieces of crabs. Oh, my, how the two of them analyzed these non-identified objects! It is hard to come across something we cannot classify in our repertory. Although there were many people around, the beach was not crowded. There were some people walking, talking, listening to music, jogging. At some point I noticed Dudu a little far from me, near a gray-haired Japanese man wearing white clothes, who stopped by his side and put something inside his yellow bucket. I saw Dudu peaking inside the bucket, looking at the man, whispering something and then becoming static. The man continued his stroll with short but cadenced steps. I was curious and walked towards Dudu, who put the bucket on the floor and, with both hands, took out an enoooormous (yes, enormous with more than one “o”) shell. It was white; one of those that make us think there is a pearl inside. It was tightly closed, locked, one might say, since it was impossible to open it. It was heavy and amazing. The three of us, speechless, kept looking at it, touching it, analyzing it. – “See? Didn’t I tell you would find a very special shell too? I sat under the sunshade. I had done my turn with the boys, now it was Daddy’s turn. But I kept thinking about what happened. My father is right: “life is really very generous”. What a beautiful moment we experienced so Dudu would learn to wait for his moment (life’s timing), to respect the differences (that his brother’s collection was different from his own), to deal with frustration (for not finding a shell as beautiful as his brother’s). Then he had the opportunity to be dazzled by the shell given to him, to feel the unexpected, to learn with destiny that, by no apparent reason, put a marvelous shell in his bucket and a beautiful present into our hearts. I am sure the children worked out what happened within their own capacity, one being 8 and the other 4 years old, but, to me, this situation was a great gift that will be kept in my heart as a metaphor of life. Now that the situation has been recorded, you all have the possibility to interpret it as you wish and, in your own way, fit it into each of your individual stories. Quem ama, educa: best-seller by Içami Tiba, a distinguished Brazilian psychiatrist and the author’s father. Little miracles happen everyday..but we don’t take the time to acknowledge them. We must stop and smell the roses. Gracias por compartir! I’m glad you’ve liked it. Thank you for tweeting it!